Television News reports about our Project, and on-line videos through Worth Valley Telly and our own YouTube channel. 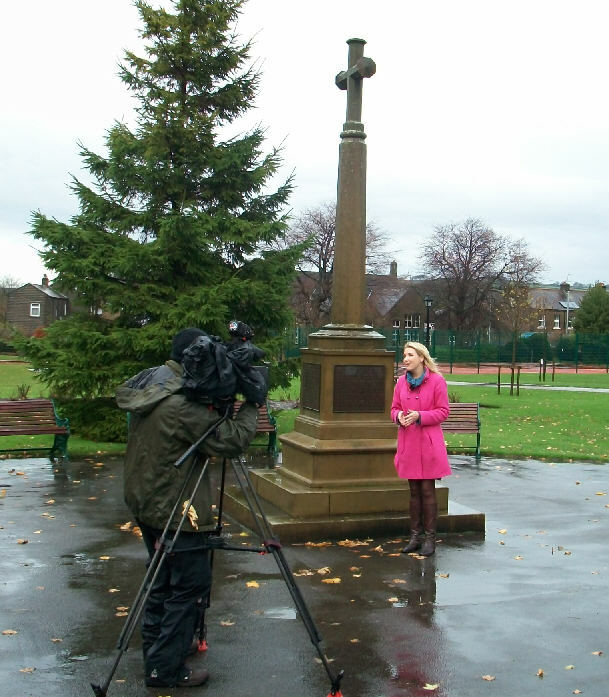 Kate Walby from Calendar News, filming the story of Harry Lund at Sutton in Craven's war memorial. We featured on Yorkshire Television in 2010, in a Calendar News article for our work with members of the Great War Forum and local lady Mona Townson, on discovering the identity of Private Samuel (Harry) Lund R.A.M.C. on the Sutton in Craven war memorial in 2010. We have a copy of this video in our own archives, but are unable to show it on here because of copyright restrictions. Harry died on 27th February 1918 after the Hospital Ship HMHS Glenart Castle was sunk the day before by German U-Boat UC-56 in the Irish Sea. We discovered that he had been rescued from the sea but later died in hospital and lies in Pembroke Dock Military Cemetery with a Commonwealth War Graves Commission headstone. We featured on Yorkshire Television in 2015, in a Calendar News article about the unveiling of Private Herbert Moore's new Commonwealth War Graves Commission headstone in Oakworth Cemetery, after we achieved Ministry of Defence recognition for him with our research. The event was attended by Herbert's family and many important local dignitaries. We also have our own YouTube channel which features our filming of the Steeton Pillboxes, and our own series of 'video shorts', which are intended to complement our pages of information on local archive resources.